Travel up Norwest Bay Rd., past the market at the corner of Mason and Norwest Bay. A block past Wakefield Rd. turn right onto Gowland. Gowland is a gravel road and at some point not too far along it turns into Reeves (no sign that says so, but it's true. I only drive up about .9 km from Norwest Bay as the road gets very rough and my little car is too low to manage it very well. There's a good place to park so I leave the car here and take off on foot at this point. Same route, but map using Mapsource. Follow the gravel road up and past the power lines to an old logging access road that heads off to the right (DON'T turn left at the first trail on your left with the big rock entrance). Turn here (it only goes right) and you'll see an old gravel pit and puddle on the left. Just past this is the entrance to Lee's Big Easy on the left. Follow the trail along and up (you will gain approx. 1000 ft. of elevation on this route). This trail though has a fairly gentle climb and easy terrain. About 1/2 km along you will come to a place that seems to have a trail go off over a cut out log on the right. The trail to the right goes nowhere so keep to the left and you will almost immediately come to an intersection. Turn right and keep heading up. 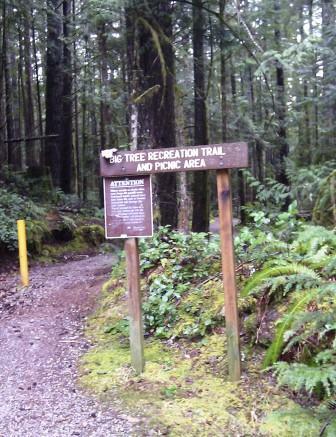 Keep on this trail that will take you over a bridge and up a steeper climb to a logging road. Turn left at the logging road and hike up a short distance keeping an eye out for the next section of trail and the start of the VFR trail (no sign), about a one or two minute walk. The logging road turns left and the trail is on the right. You can see it cutting up the bank, but the entrance is a little harder to see. 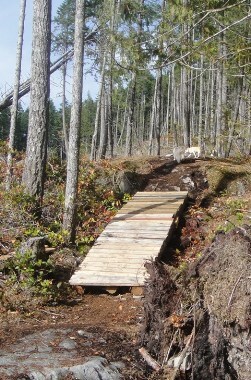 This trail had been closed due to logging and only recently reopened after the logged section was rebuilt by some of the Capilano University Mountain Bike students. Once you are on VFR you will stay on it for a couple kilometres and keep on climbing until you reach the highest elevation of 1300 ft. or 409 m and then back on down again. The trail cuts through the logged area and down the hillside you can hear hundreds of frogs croaking (at the right time of year). You will come to a switchback area and not too far past this you'll come to the VFR trail sign that has a cut out of a plane. This is an indication of why the trail was called VFR. Apparently quite a few years ago a small plane crashed somewhere in this area and VFR was part of its call number. This is also the entrance to the Crowston Summer trail which will take you down to the northeast side of Crowston Lake. Keep following along the trail generally northwest. The Parbac trail cuts off to the left and will also take you down to the Big Tree trail, however these instructions follow a slightly different route. 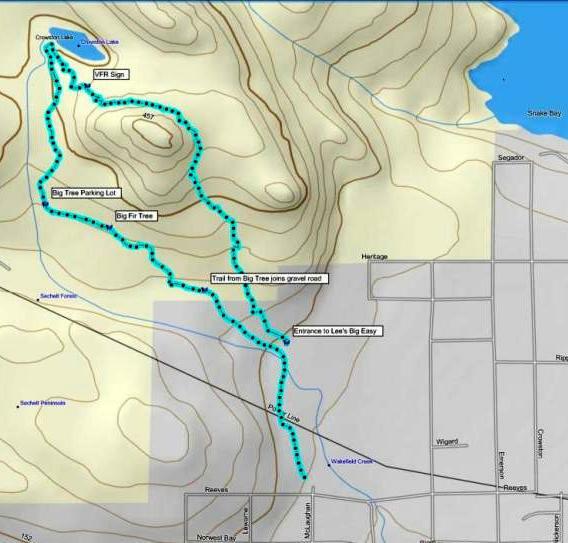 Keep heading northwest and this trail which is also Parbac will take you along the south side of Crowston Lake and then out to the Halfmoon Carlson Forest Service Road. At the service road turn left and follow it down for about two kilometres until you get to the Big Tree parking lot. There are several large muddy puddles along this road and you will see the logged area on your left a short distance before you get down to the parking lot. On your right as you head down this road you will also see a couple of trails that cut in on the right. These trails take you into an area of the Big Tree Recreation Site and connect you over to Skullduggery and Overeasy up to Desoto Ridge. From the parking lot head along the Big Tree gravel trail for less than a kilometre. 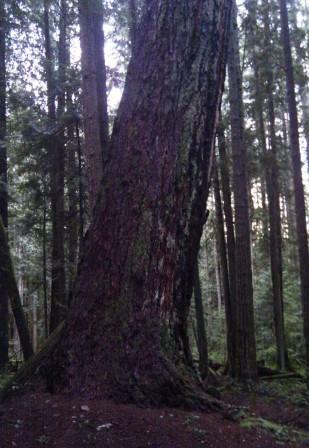 You'll go by an outhouse and come to a picnic table where you can check out one of the big fir trees that this area is named for. Total distance is approx. 9 km or 5.5 miles. Click here to return from VFR to the Bikes & Hikes page. Click here to return from VFR route to the Sunshine Coast Trails Home page.